The Marvel Cinematic Universe’s expansion has touched on even the more tedious parts of a superhero’s life, like paying rent, courtesy of Taika Waititi’s Team Thor short films. The Thor: Ragnarok director introduced fans to the Odinson’s mortal roommate Darryl last year, who won’t actually be in any Thor movies, but will return for a new short, according to Jeff Goldblum. The actor, who plays the Grandmaster in the upcoming movie, tells Radio Times—an article which, we have to warn you, is full of spoilers, so please proceed with caution—that we’ll see his character shack up with Darryl at some point. I shot a thing with Taika, where there’s a roommate in Australia. I show up at his, and I do knock on his door. And I take up residence in the little flat, as they say here. That’s what I do. And order things from the takeaway restaurant. Buy all the local foods. 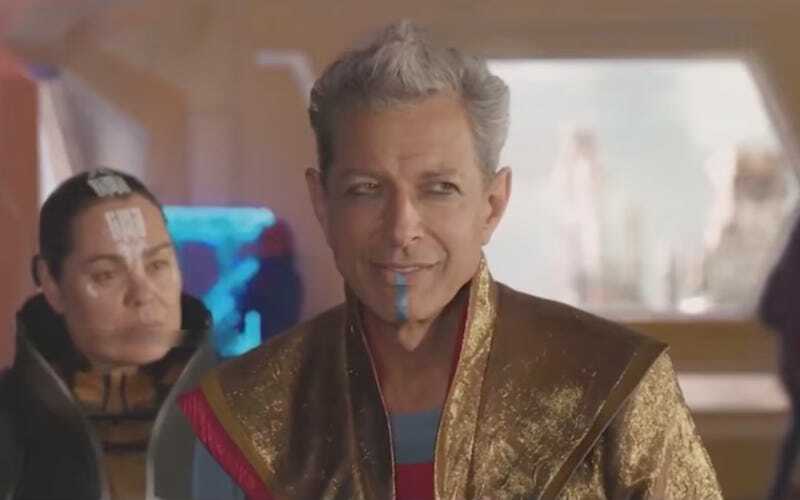 Based off Goldblum’s little synopsis, it sounds like the Grandmaster is a much better roommate than Thor, which might have something to do with not being born a god. There’s no word on when we’ll see the new short, or if the promo will even be released with Ragnarok now just days away. But it’d make for a great Blu-ray extra.